On my quest for a set of pearly whites, I've been testing out this new Perfect White Black duo from Beverly Hills Formula which contains activated charcoal to help whiten your teeth. Whitening teeth products are big business in the beauty industry, but many of them contain bleach and other harsh chemicals that are no good for sensitive teeth (or anyone's teeth in the long run). My teeth are very sensitive and I've always struggled to find whitening products that don't hurt them, so I thought I'd try these out from Beverly Hills Formula's Perfect White Black range. They don't contain bleach or any harsh chemicals, are low abrasive, and instead uses activated charcoal to remove stains (especially tannins from tea), combat bad breath and brighten and whiten teeth over time. This feels and smells like a regular mint toothpaste, but the paste is black in colour thanks to the activated charcoal in the formula. It's weird at first seeing it on your toothbrush but you soon get used to it! I've been using it for about a month now and have already seen a small difference so far, especially with the toothpaste removing everyday stains like tea and wine, so I'm hoping the results get better the longer I use it. I generally stick to mouthwashes that are formulated for sensitive teeth, however I haven't had any problems using this one. Like the toothpaste, it features that key ingredient of activated charcoal, but other than that, it doesn't taste or smell any different - in fact it's very minty! You have to shake it to activate it, and I was impressed by how long it kept my mouth fresh for afterwards. I can't really comment on the whitening effect though as I haven't seen much of a change other than a small difference, but it's still very early days and I'll continue to use this alongside the toothpaste. Even if it doesn't have a whitening effect for me, I would buy it again based purely on how minty it is! 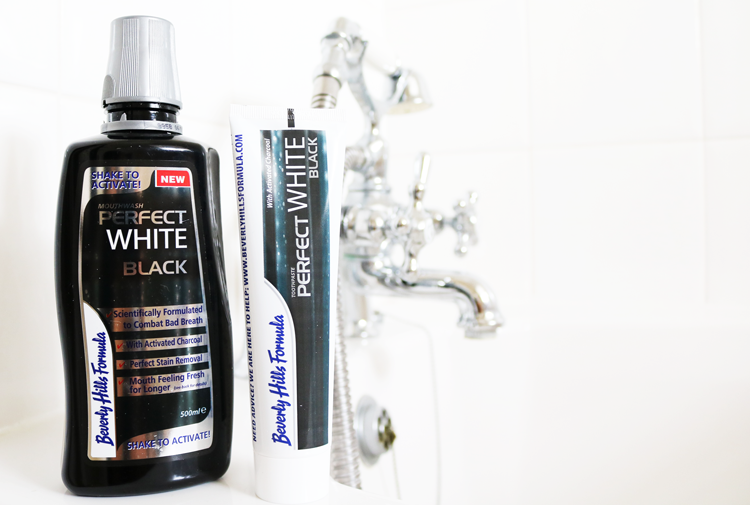 Beverly Hills Perfect White Black range is available from Superdrug, instores and online. Currently half-price if you fancy trying them! Have you tried any charcoal based toothpastes / mouthwashes? I really want to try this ive used their gold toothpaste and it was amazing! I've heard good things about their Gold toothpaste - will have to try it! I'm excited to try this! I bought the activated charcoal and it was a mess to use. Pinterest fail for sure. I'm going to pick some up. Thanks for reviewing!